ON THE SAN PEDRO CHANNEL — The fishing boat idles five miles off the California coast. Anne Cleveland bobs in the dark chilly waters. After three hours in the drink, she has stopped swimming. She shivers. “Gut it out!” yells Paula Selby, an official on board. She’s overseeing Ms. Cleveland’s swim between Rancho Palos Verdes and Santa Catalina Island in the Pacific Ocean. Ms. Cleveland complains that her neck is raw from the salt water and that she has a queasy stomach. She takes a few reluctant strokes and stops, treading water. “How much longer?” she asks. The 21-mile Catalina crossing is a mere warm-up. Ms. Cleveland is training for the so-called Ocean’s Seven, swimming’s take on mountain climbers’ “seven summits.” It is attracting a small cult of aquatic fanatics. Marathon swimmers once proved their might by crossing the English Channel between Dover and northern France. For some, scaling the nautical Everest has become as routine as a weekend hike. Nearly 1,200 people have swum those 21 miles, including grandfathers, children and amputees. Steven Munatones, a coach and marathon swimming guru, thought swimmers needed more challenges, so he devised the Ocean’s Seven — a list of channels that a well-rounded marathoner should master — and posted it on his website devoted to distance swimming. There’s the English Channel, for old time’s sake; as well as the Catalina crossing; Cook Strait in New Zealand; the Tsugaru Channel in Japan; and the shortest, the Strait of Gibraltar, about eight miles between Spain and Morocco. Most swimmers say the toughest are the Molokai Channel in Hawaii, at 26 miles, and the frigid North Channel between Scotland and Northern Ireland. Mr. Munatones chose them for their geographic and climatic diversity, extreme hardships and the intricate planning needed to succeed. If 70% of the Earth is water, “we have yet to really scratch the surface,” says Mr. Munatones, publisher of the Daily News of Open Water Swimming and other websites he runs from his home in Huntington Beach, Calif.
A dozen swimmers have taken up Mr. Munatones’s dare, he says, since he posed it in 2008, and others have expressed interest. He tracks swimmers’ progress on his blog. Swimmers must schedule their own attempts with the local groups that set rules, and in some cases verify, each crossing. He counts swims done before he created the challenge. James Pittar, 41, of Sydney, Australia, has five crossings and is the furthest along, though he is blind. This month, he ditched his Molokai attempt after five hours in high waves. Forrest Nelson, 45, of Los Angeles has crossed four, and would like to attack the Irish channel next. Some of the channels are ice-cold. Some are very warm. Above the surface and below, dangers lurk. Swift currents, fog and swells can swamp a swimmer. Medusas, or jellyfish, can sear skin. Six years ago, Ms. Cleveland plowed through biting winds and four-foot chop on a trip from Dover to Cap Gris Nez and back, a double English Channel crossing in 28 hours and 36 minutes. Last winter, at 54, she began thinking: What if she made the Catalina crossing twice — a 42-mile jaunt? She would be the first person to swim the round trips of both major channels — a “double double” in swim parlance. It would prep her, she thought, for tougher Ocean’s Seven swims. Catalina can rattle seasoned swimmers, and this season it has been troubled water. 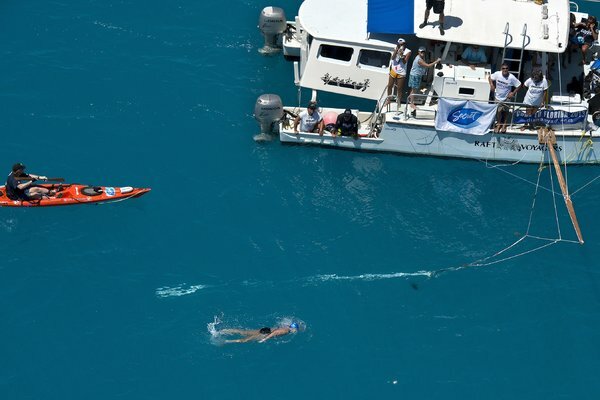 A third of the 41 solo swimmers this year didn’t finish, with colder-than-normal sea temperatures, in the low-60s, says Ms. Selby, a board member of the Catalina Channel Swimming Federation. The group sets the crossing rules. Ms. Cleveland grew up swimming in La Jolla, and trains up to 37 miles weekly in the pool and sea. She sells real estate, and the sour market has helped free her time. The day of her big swim, graphite-colored clouds blanketed the sky. Ms. Cleveland was wearing a Lycra suit approved by the channel federation, which bans anything buoyant or insulating. A silicone cap covered her platinum hair. Ms. van der Byl slicked Ms. Cleveland’s chest and freckled arms with a mixture of zinc oxide and flesh-toned surfer’s sunscreen. “War paint,” Ms. van der Byl said, “to scare all the fish off with.” That’s the swimmers’ euphemism for sharks. “See you guys tomorrow afternoon!” Ms. Cleveland said. 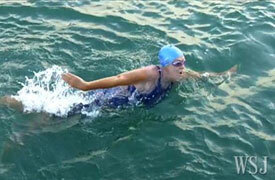 At 5:20 p.m., she walked into the teal blue waters and started swimming toward Catalina Island. For nearly three hours, she freestyled with gusto, holding more than two miles an hour. The swells were gentle. Dolphins glided by. She said little to her friends who kayaked alongside. According to the rules, she couldn’t touch them or the boats. Every half hour, a kayaker tossed her a carbohydrate drink. She rolled onto her back, chugged the liquid, and resumed her pace, all in 20 seconds. After nightfall, Ms. Cleveland complained of cramping. She couldn’t keep down the liquid. An hour later, she stopped. “I can’t swim anymore. I’m cold,” she said in a small voice. “You got to keep cranking to stay warm!” Ms. Selby said. For five minutes, Ms. Cleveland stopped and started. She paddled toward the stern, as her boat mates told her, no. She wavered, then touched the boat’s metal step. Ms. Selby called it quits at 9:28 p.m.